OneShotVariety.com generously let me pick one of their items to review. As you can see, he also SINGS! which you will hear soon. He came with batteries, so I was able to light him right up! er where his nose once was. He shimmies forward as he sings, as you can see. So don't put him near the edge of a table like me. Except for that, he's pretty much perfect! but OneShotVariety.com has other spooktacular stuff! For example, you purchase a Shrunken Head for $2.95. You then email them at customercare@oneshotvariety.com. and let them know you're a follower of Holly's Horrorland. Then they'll reply to tell you they'll be adding the diorama to your order completely free! Wow! That talking/singing candelabra is totally awesome. And shrunken heads? 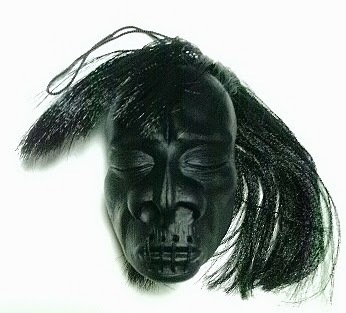 I'm just wondering, are the shrunken heads mentioned here authentic? Either way, they're neat. 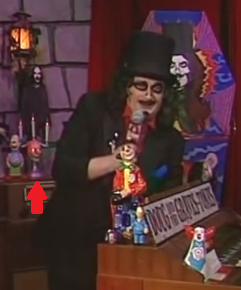 You really are a collector of creepy curiosities, Holly. Thanks! I'm smitten with the skull. I think he needs a name! The shrunken head is named Mokibno. And nope, they're made of plastic, but look like the real deal! Ooh, I'm sure that's an interesting story! So glad we're getting closer to our day! Hope you're well too, dear Dr. Theda! Dude, shrunken head! I wonder where mine got to? Heads will roll! ;) Hope you find it!